An article over at Small Wars Journal, Preventing OIF III: Using the Interagency Conflict Assessment Framework to Achieve a Sustainable Iraqi Security Force, tackles the tough issue of the long game in Iraq: preventing continued civil war after the fall of ISIS. Authors Christina Bembenek, Darrel Choat, Randy Hughes and Thomas Petersen argue that the answer can be found using the Interagency Conflict Assessment Framework (ICAF) to analyze the conflict dynamics affecting Iraq, and to develop solutions to address those key fundamental issues. Using the ICAF methodology, the team identifies underlying factors such as sectarianism, corruption, weak judicial institutions, unemployment, poor education, which prevent the development of a professional and trusted national force. The authors point our that the current strategy focuses on rebuilding the ISF, rather than addressing the “political, judicial, demographic, economic, and social challenges within the security forces that must be resolved to build a truly capable force.” It’s scope is almost exclusively focused on the military aspects of training, advising, and assisting Iraqi forces. To create a more successful ISF, the Department of Defense (DOD) should use the Interagency Conflict Assessment Framework (ICAF) – an effective tool that creates a shared understanding of complex problems and leads to collaborative and coordinated responses to conflict. Using the ICAF to develop a strategy for rebuilding the ISF would enable an effective whole-of-nation approach and create a more capable and sustainable ISF. 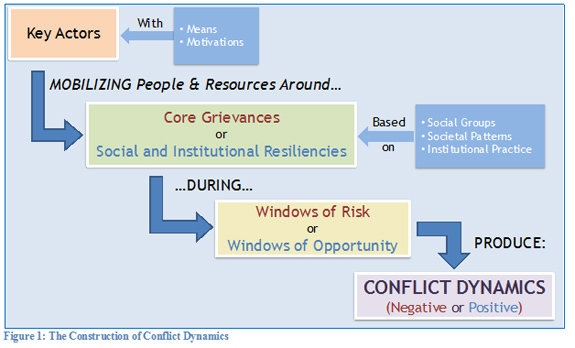 As described in the SWJ article, ICAF is an instrument for joint analysis of conflicts and instability based on conflict theory which claims conflict occurs when key actors, with the appropriate means and motivation, mobilize social groups around their core grievances during a specific window of opportunity. Developed in 2008 by an interagency working group, and revised in 2014, the purpose of ICAF is to enable a whole-of-government approach by providing”rigorous shared analysis of a society’s key conflict dynamics that will inform U.S. policy, plans, and action.” [ICAF, 2014] This shared understanding helps produce a more coordinated and effective response. The basic principles of the ICAF – priority-focused, locally-grounded, joint, agile, accessible, and structured — ensure a practical, flexible, whole of nation approach to resolving conflict across multiple scenarios. By focusing on key policy questions related to the conflict dynamics, and prioritizing the most challenging and promising of these dynamics, ICAF produces “concise analysis and recommendations useful to decision-makers in policy, planning, and action.” As its name implies, ICAF also ensures that multiple perspectives are involved, including US government agencies, international organizations and non-governmental organizations, local parties, and partner nations. The ICAF is a powerful and comprehensive tool for developing a whole of nation strategy for building a sustainable ISF. By analyzing and truly understanding the multiple conflict dynamics affecting the ISF and involving key stakeholders in their resolution, we will build a much more resilient, respected, and professional force. The current military-focused strategy is insufficient — the Soldiers, Sailors, Marines, and Airmen currently advising the ISF have done a magnificent job, but their efforts alone cannot overcome the powerful dynamics ready to tear the proud Iraqi force apart. Through the rigorous application of the ICAF, we can leverage the United States’ and our coalition partners’ vast capabilities and experience to create lasting stability in Iraq through a respected and professional Iraqi Security Force.